Usually, the things that scare us most are the things outside of us. Like boogeymonsters hiding under our beds. Or wolfmen waiting around the corner to pounce at us. That's what makes Halloween skeletons so unique. There's a skeleton inside each and every one of us, yet sometimes the sight of them makes us shriek in terror on that chilly all hallow's eve night. But skeletons are not all bad. Sometimes the reanimated bones of dead guys and girls just wanna hit the town and have some fun. 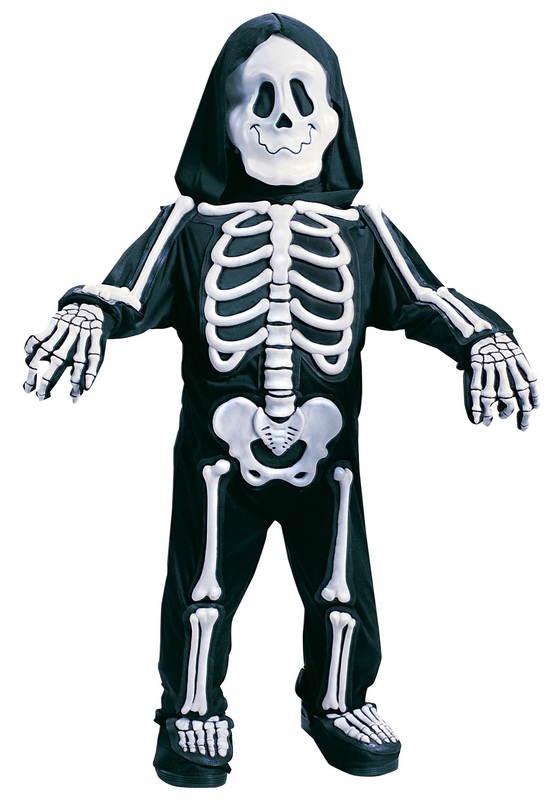 We keep this fact in mind when it comes to this Child White Skeleton Costume. Maybe your child isn't interested in haunting the neighborhood and he hunts down Halloween candy, he might just want a little bit of spooky. That's what this costume is, just the right amount of spook. But we had to make sure, even with just a little bit of spook, that the costume would be built solidly. And this one is 100% polyester for a comfortable and durable fit. The black jumpsuit has an attached hood and an attached foam skeletal bones look. The smiling skeleton mask has an elastic strap to make sure it stays on for all trick or treating. The costume also comes with matching gloves and adjustable shoe covers. Make no bones about it, it's spooky! Be sure to add one of our skeleton candy buckets, or any of our other Halloween buckets to be sure your little one has plenty of candy storage!